In Japan, sea lions demonstrate their ability to do traditional calligraphy to ring in the new year. In Wisconsin, it is an African elephant named Brittany. From Nevada, a horse named Cholla has been painting for the past four years. Animal artists also include dogs, chimps, ocelots, kangaroos, pandas, and even Komodo dragons. Whether you are an art aficionado or not, it gives one "paws" to think. According to the Association of Zoos and Aquariums, getting animals painting is most often part of enrichment programs geared to improve the lives of wild animals living in captivity. Enrichment programs are designed to help keep the animals healthy mentally and emotionally. The enrichment programs are quite varied and may provide mud, rotting logs, or leaf litter for animals to explore. By far the art created by the animals have made this the most popular of the programs with humans, and are often sold to help create funding for the facilities where they live. 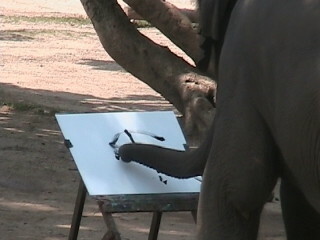 Brittany, the elephant, appears to truly enjoy her artistic endeavors, flapping her ears enthusiastically as she works. A true temperamental artist, she can only work when the mood is right. So she is offered her brush only about once a month. While Brittany does not create her masterpieces by the trunk load, the Milwaukee Zoo sells Brittany's paintings in the gift shop for a modest price to help with zoo funding. Some animal paintings have actually brought some eye-opening prices at sale. Two paintings by Towan, an orangutan, were auctioned off on eBay for $1,300. Three paintings by a chimp named Congo, painted in the 1950s, sold in 2005 for more than $26,000 at an auction among the Renoirs and Warhols. Cholla, a mustang-quarter horse mix originally from Nevada, has created a rather large body of work. some of which has been displayed at art galleries and exhibits from coast to coast. He has even been included in a juried art competition in Italy. The judges there were dismayed to find a horse had entered, but since the competition was officially open to anyone, they let him compete. Tillamook Cheddar, or Tillie, a Jack Russell terrier, created her first piece of artwork when she missed the paper and made a deposit on the floor. According to her owner the resulting "sculpture" clearly resembled a man lying on his back, two legs, two arms, the works. Tillie has moved on to less aromatic art forms, such as painting. Her life has been chronicled in the biography Portrait of the Dog as a Young Artist: Art from Scratch, by the World's Preeminent Dog Painter, by F. Bowman Hatie III, which is available on Amazon.com. Much of this artwork resembles what you might find attached to the refrigerator of any kindergartner's parents or grandparents. However, most of the sales are not to art collectors, but to animal lovers who know that the money they are spending is going to the welfare of the animals. There is also the likely cachet of having animal artwork as a conversation piece, not to mention concrete proof that you are more animal lover than art lover.